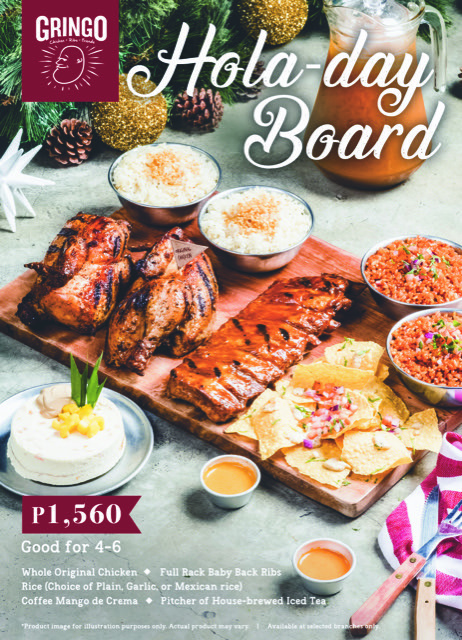 The Classic Board (P1,560) has Gringo’s world-famous juicy, tangy, lemony, roasted chicken and fall-off-the-bone baby back ribs drenched in home-style BBQ sauce. Feliz’s Board (P2,680) features her signature Seafood Skillet loaded with shrimp, cream dory, potatoes, tomatoes and, to give it a bit of kick, bell peppers and a special blend of spices. Finally, Noel’s Board (P2,640) has his unbelievably savory premium USDA steak—made extra special with sautéed bell peppers with a hint of sour cream—as its centerpiece. So don’t miss out, amigos. Drop by Gringo’s place right now. 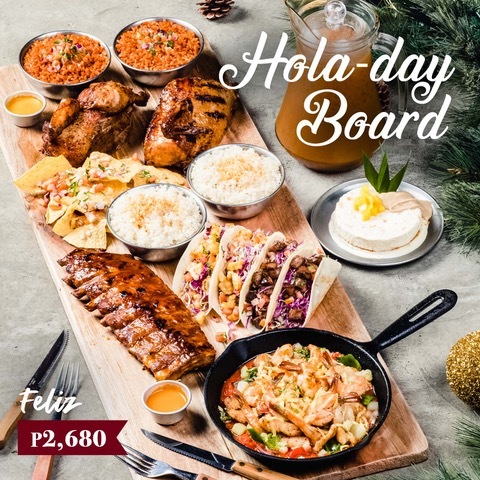 The Hola-day Boards will only be available for a limited time at the following branches: SM North EDSA, The Fort BGC, Palanca St. Makati, SM Megamall, MAAX MOA Arena, U.P. Town Center, SM Sucat, Ayala Malls the 30th, SM CDO Downtown, O Square 2, Greenhills, SM Marilao, Festival Mall, SM Manila, SM Legazpi, SM Santa Rosa, and Ayala Malls Feliz.